A few months ago, I promised you a review of Jim Collins’ bestseller Great by Choice: Uncertainty, Chaos and Luck – Why Some Thrive Despite Them All, but I realized that I never posted my thoughts. Rather than a traditional review, I’d like to go over the highlights and discuss how the concepts can apply to your career. After all, what’s the point of a review if you don’t know how you can apply the things you’ll learn about in the book? The 10Xer (pronounced “ex-er”): By definition, 10Xers are companies that beat their industry by 10 fold. Collins’ research finds that 10Xers aren’t more creative, more visionary, more charismatic, or more ambitious, more blessed by luck, more risk seeking, more heroic, or more bold. They’re focused on data with great discipline and stick to their plan (ie: their 20 Mile March.) They’re consistent. In your career or job search, are you sticking to the plan? Do you have a plan? What is your 20 mile march? Do you continue to develop yourself as a professional, learning and tweaking your strategy along the way? Zoom Out, then Zoom In: The 10Xers possessed a “dual-lens capability” in which they could zoom out to see changes in the environment and assess risk and then zoom in to focus on the superior execution of plans and objectives. In other words, don’t get lost in the weeds. It’s important to understand the macro before you tackle the micro. In your job search or at work, are you zooming out first to understand the bigger picture? Knowing this will help you find the right long-term solution vs. a quick fix. Bullets, then Cannonballs: In the book, Collins describes this concept as a lesson in calibration. Let’s use the legendary pirate metaphor: Imagine if you had a limited amount of gunpowder on a ship. 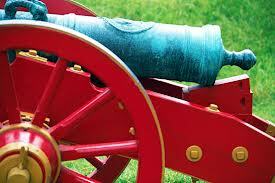 Would you pool all your resources (the gunpowder) to fire a cannonball at a target? What if you miss? You’re definitely in hot water then. But, if you use just a little powder to fire a few bullets to test the wind direction and other factors, taking into account the differences you will encounter will a larger shot, you can then use the rest of the powder to fire the big one – the cannonball. Lesson: Fire bullets first. Test the waters. Learn what works for you, recalibrating along the way. When you have empirical validation that you’re on the right path, fire the cannonball. So, what did I really think about this book? Honestly, it was pretty easy to read, has real-world applications, and the multitude of case studies (my favorite ones were Scott/Amundsen, Southwest Air, Apple, and Microsoft) made it all come together. My employer even felt that the business concepts of this book were so important that we read and discussed it at length during our summer strategic summit, helping us each understand how it applies to what we’re doing as an organization. Just reading a book isn’t enough – at least, not a business book or a book meant for personal or professional development, in my opinion. For most of us, simply reading something only sticks with us for a short while. Take good notes. Note how the book relates to what you’re doing right now, what you’ve done in the past (successes and failures) and what you can do to improve your future. Apply the key concepts to your career. I’ve found that the best books continue to give you inspiration throughout your life. In fact, some of my best BHAGs have been inspired by them. Will you apply the principles from the best and choose greatness? PS. If you want to know what a BHAG is, I’d highly recommend reading Good to Great, also by Jim Collins. You don’t necessarily have to read it before Great by Choice, but I found that it helped. PPS. I read plenty of fiction for entertainment as well (didn’t want you to think I’m a boring business book guy.) My favorite authors include James Patterson and Michael Crichton. Just finished Crichton’s Micro and I give it two thumbs up! It was a great escape over the holiday break.